What is the Lowrance Hook 4 Best For? Sixty-one years ago, the sport of fishing entered a new era colored by the release of an exciting technological device. Lowrance released the “little green box,” the first-ever consumer sonar device, in 1957. Since then, sonar-powered fish finders have become a staple in many anglers’ tackle boxes. Their ability to provide a view of the underwater realm is invaluable in the sport of fishing. 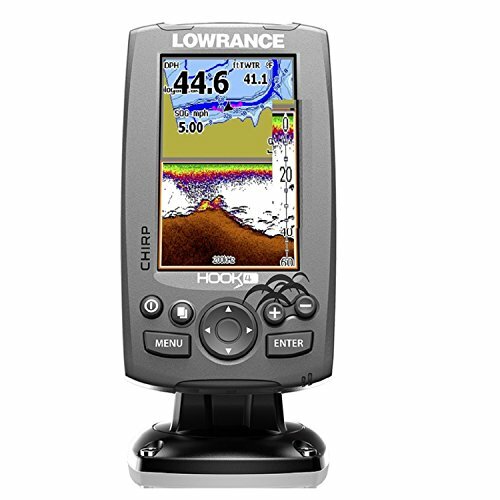 Lowrance has released several versions of fish finders in recent years. The Lowrance Hook 4 came out in 2016 and offers the basic functionalities of a fish finder, along with some added technological benefits for users. In terms of functionality, the Hook 4 is fairly basic compared to some of the models that Lowrance has released more recently. However, this isn’t necessarily a bad thing; it has several qualities that make it a desirable purchase. The Hook 4 features industry-standard sonar capabilities with CHIRP and DownScan. CHIRP stands for Compressed High-Intensity Radiated Pulse and has been used by the U.S. military for years. It works by transmitting slow sonar pulses, which put a significant amount of energy into a water column, resulting in clear, accurate depictions of fish below. Because this model works with DownScan, it can only see what is directly below your boat rather than in the surrounding areas. Accurate sonar is important, not only for identifying fish, but also for safety. Having knowledge of where the bottom of a body of water is can prevent some less than desirable encounters with underwater structures. A special feature of this model is “TrackBack” which allows the user to view sonar readings that have been taken on previous trips. It can also pinpoint places on the map that have had a lot of fish activity in the past. This prevents unnecessary fuel loss over time from trying to find your favorite fishing spot. With the trademarked “advanced signal processing”, the Hook 4 clearly depicts goings on underneath the surface with little interference. Many fish finders on the market get tripped up on the differences between underwater debris and fish; this particular model shows a clear picture of the scene underneath your boat so there is little guessing to be done. GPS Installation - The inclusion of GPS on this model is a real pro because it adds so much ease to the process of locating your favorite fishing spots. Although it may seem like a no-brainer to include, many fish finders on the market do not come with a built-in GPS. In addition, this model comes with a U.S. map detailed with more than 3,000 lakes, rivers, and coastal contours to 1,000 ft.
High Definition Screen- Though the four-inch screen may be too small for some users’ preference, the screen resolution is crisp and clear. The pixilation resolution is 480 x 272, which trumps many fish finders on the market in terms of clarity. The screen also has an overlay feature that allows you to see both the DownScan and the CHIRP system at the same time to provide more insight into the scene below. Quality- The Hook 4 is made with super-durable materials that are made to last through fishing trip after trip. It’s also IPX7 waterproof, which means that it can withstand rain and a few splashes from unexpected waves. It can also be immersed in freshwater of up to one meter. Small Screen Size - Even though the display resolution is high quality, the four-inch screen is fairly small and can be inconvenient for some users. There are definitely some fish finders on the market with larger screens. Difficult to Set Up- The fundamentals are fairly easy to gauge after a small amount of use, but many users complain that the learning curve for all the additional features on the device is quite steep. The instructions that come along with this model are not comprehensive, so operating this device might take some extra research. There are many YouTube videos and online tutorials that can be helpful in learning how to use it. Boot-Up Time- This device takes at least 2-3 minutes to boot up before using, which isn’t a real detriment to the product, but it can be annoying to have to wait over and over again. While the Hook 4 isn’t the most innovative fish finder on the current market, it’s a great basic for beginners or those who want a no-frills type of device. It nails the fundamentals of sonar-based fish finding. From the company that started it all, Lowrance aims its fish finders at a general audience, so it's suitable for almost all anglers. Because this unit is not very large, this is a great option to bring on your small boat or kayak. It’s also super easy to mount, so there are no worries in terms of set up on a smaller watercraft. It’s compact size also makes this an easy fish finder to travel with. If you’re an angler who enjoys hiking into your favorite ice fishing spot or you take a lot of fishing trips, this is a good choice as it doesn’t come with a ton of bulky equipment to keep track of. As this is a more basic fish finder, it is not castable, and only works when suspended above a column of water. For this reason, the Hook 4 is good for freshwater anglers who regularly fish offshore rather than onshore. The Hook 4 is an admirable pick for a fish finder for a multitude of reasons. Though it isn’t the most advanced device on the market, it does its primary, most important job very well. It offers state of the art sonar capabilities with CHIRP and DownScan, which provide a crystal clear picture of the underwater atmosphere. The fact that you can overlay the two signals on the screen for more information is also an added benefit. Before purchasing this fish finder, keep in mind some of the cons, as they may be deal breakers for you. The screen size is quite small, which can be an annoying trait if your eyesight isn’t in tip-top shape, and it might take a little extra research on your part to learn how to use the device. Overall, a recommendation for this fish finder comes without hesitation. It’s a great starting place if you’re looking to try out a more basic tool without a bunch of unnecessary additional qualities, and it won’t break the bank either.